Violent winds over 80mph are forecast to batter the Western Isles later tomorrow. The Met Office has issued a yellow “be aware” weather alert for the Hebrides as a very deep area of low pressure is expected to track to the northwest. 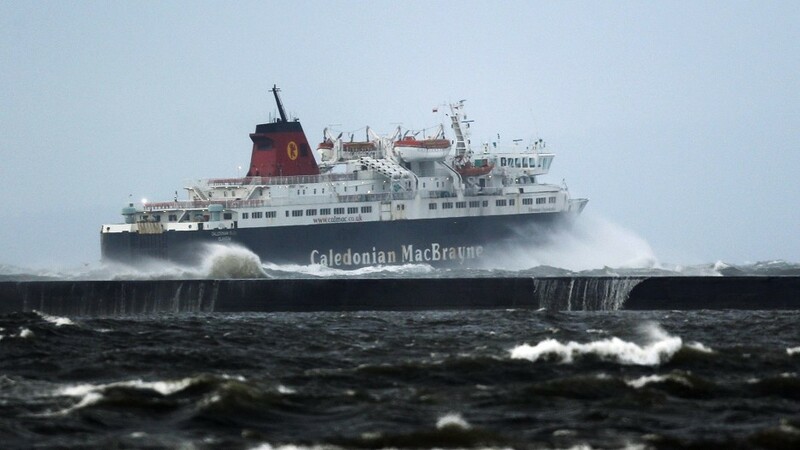 Most Western Isles ferry services were cancelled or badly disrupted yesterday (Mon) due to high winds and rough seas, particularly in the southern Minch. Gales are set to strengthen, touching violent storm force 11, over the first half of the week, resulting in further ferry disruptions until Wednesday. The MV Hebrides was weatherbound in Tarbert and unable to operate any service on the Skye, Harris and North Uist route. Passengers were due to board her last night (Mon) for a midnight sailing, calling at Lochmaddy at 3.45am and onward to Skye. The ferry will operate an amended timetable until fierce winds blow up again tomorrow afternoon. The Clansman cancelled her voyage to Oban. She was due to leave Castlebay at 5am and sail directly to the mainland, missing out Lochboisdale.. The skipper of the MV Lord of the Isles planned to take advantage of the lull to run from Oban to South Uist to arrive around 4.30am tomorrow after a longer but sheltered route around Rum. Both South Uist – Mallaig sailings are cancelled tomorrow. The Stornoway – Ullapool route has been placed on amber alert for tomorrow.